Single piece rough surface compression screw. Most successful brand among all surface treated implants available . 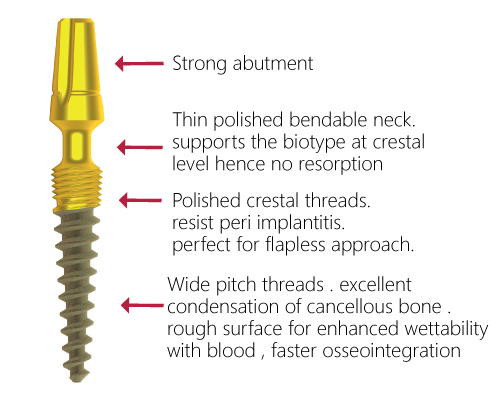 Has thin but strong bendable neck and polished crestal threads preventing crestal bone resorbtion and infection creating best aesthetic results . Multiple abutment options with various angulations is been availabelwith multiunit successfully completing the need of the site and the patient . Apical wide pitch threads With rough surface increases wettability and micro anchourage . Simpladent Implants has changed the world of implantology entirely. 4th floor, KM Trade tower, Radisson Blu Kaushambi, Ghaziabad, India.